HOW TO SELECT CARPET CAR FLOOR MATS? Home > News > HOW TO SELECT CARPET CAR FLOOR MATS? A new set of Carpet Car Floor Mats can always take the car interior styling to a higher level. When it comes to a luxury feel, nothing is softer and more luxurious under your feet than carpeting. BEST WAY sorts out all the important points of Carpet Car Mats, to help make purchase decision. Most carpet Car Floor Mats are made of synthetic materials, like polypropylene or nylon, with anti-slip vinyl backing. Synthetic materials are for over-all lower maintenance and better wear. Texture differs by material and weight, customer can send picture to match the texture. Most customers judge carpet based on weight, more precisely, the weight per square meter. The most commonly used material is polypropylene 400g/sqm and 500/sqm. Custom fit mats are made to fit 100% the car, designed to match all the specific shape of the exact model. Universal fit mats are designed to fit pretty much anything on the road. To do this, these mats are dimensionally smaller than custom floor mats and while they can be installed in any ride. They won`t provide as much floor protection as custom floor mats but they cost much less than custom mats. We can help make mats embroidered with Officially Licensed logo, or most popular pattern, name or initials... The opportunities are endless! 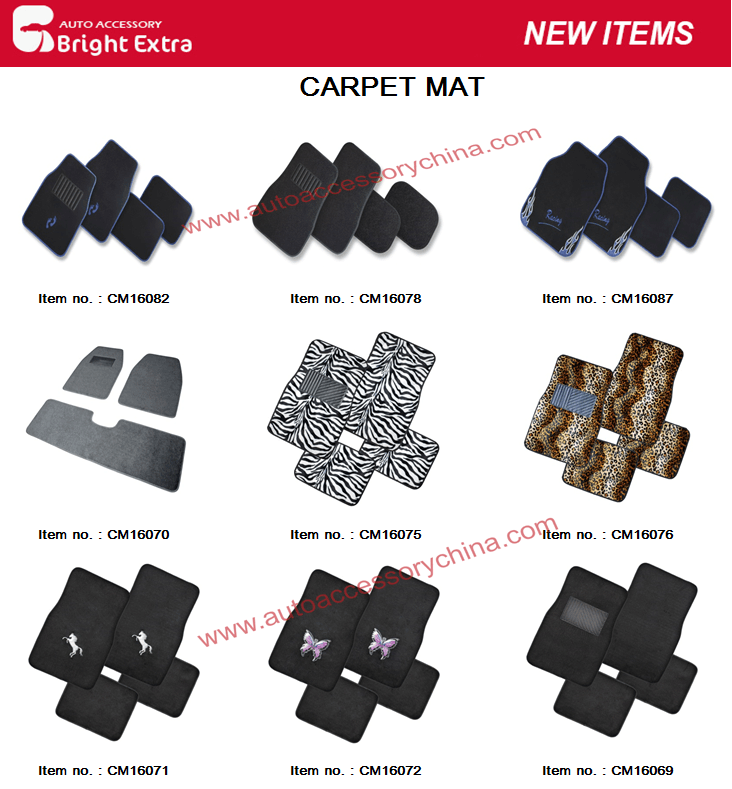 Best Way provides a big selection of Car Floor Mats, such as Custom Fit Car Floor Mats, Carpet Car Floor Mats, PVC+Carpet Car Floor Mats, PVC Car Floor Mats, Custom Rubber Floor Mats For Trucks, 3D PVC Car Foot Floor Mats, Colorful PVC Car Floor Mats, Trunk Mat , etc. We can provide customized service based on your detailed requirements! Please contact us freely for more information!